Q: What is the most consecutive points a tennis player can lose and still win a best-of-five-sets match? There's no trick. It's a straightforward question. The modern tennis tiebreaker rule does not come into play. So basically you've got to figure how many sets you can get behind and still be able to catch up? Edit: You'll be almost ready to lose the 19th consecutive set. Add 57 (hint: Heinz "ketchup") and you have 76 points. Darn! It was going to be so easy when I invoked the modern tennis tiebreaker rule! What a stupid and provincial puzzle, requiring knowledge about sports, in which I have no interest, and about a particular sport with its own peculiar rules. No puzzle for me this week! Love of sports, particularly tennis, certainly serves as an advantage this week. I will not offer a 'court challenge' to this puzzle. Bye week for me, I won't even research this one. I concur, Will has once again demonstrated his uncanny ability to annoy his audience. Perhaps we should raise a racket. So "What is the fewest number of total points (consecutive points) a player needs to win to stand at match point in the 3rd set of a 5-set tennis match?" The answer will be the answer to the challenge, since the player's opponent must win the next point to stay in the match. This is the same as "What is the largest number of consecutive points a player can win to arrive at match point in the 3rd set of a 5-set tennis match?" The same as Blaine's formulation. Now you have it. But when you use fewest that is not correct. There is a difference. "The fewest number of total points" occurs only where the player wins EVERY point for a 6-0,6-0,6-0 victory in a 5-set match. The fewest number of total points (consecutive points) a player needs to win to stand at match point in the 3rd set of a 5-set tennis match is different than the largest number of consecutive points a player can win to arrive at match point in the 3rd set of a 5-set tennis match. "The fewest number of TOTAL points (consecutive points)"
Think about Blaine's clue: So basically you got to figure how many points you can get behind and still be able to catch up? Maybe later you can explain how your scenarios are the same. I'm telling you that fewest is one less than largest to end one point away from losing the match in the third set. And largest is the answer. One more than the "fewest" at match point would be the match. It's actually "what is the largest number of total (consecutive) points a player can win to stand at match point in the 3rd, 4th, or 5th set?" Just remember...the start is not necessarily the beginning. And one more than the largest at match point would be the match. And largest is one more than fewest whether you are talking arriving at match point or actually winning the next point to win the match. Exactly bhunter. ron will get there. Oops, when I say that largest is one more than fewest I meant to say by more than one. Perhaps start here: what is the largest number of consecutive points you can win in a single set? The fewest number of TOTAL points to arrive at match point is a number where an opponent wins NO points (therefore these points are consecutive). The largest number of CONSECUTIVE points necessary to arrive at match point is the same where an opponent wins NO points. It doesn't say "consecutive from the start of the match". It says "consecutive". What if I win the first two points to go up 30-love and then lose the rest of the points in the match? That's still the same number of consecutive points lost as if I lost all of the points. What you said (the situation where an opponent wins no points) is the FEWEST number of consecutive points necessary to arrive at match point. However, that answer is incorrect. Remember, we are talking POINTS, not GAMES. Each set requires a minimum of 6 games won and each game requires a minimum of points won. If you go up 30-love and then your opponent wins the next 4 points and the game and the rest of the games in that set and then all the remaining points to arrive at match point, the CONSECUTIVE points your opponent has won will be the SAME number as if you had won NO points at all up to match point. True. But there are situations where you can lose more consecutive points than the number you mentioned. Your situation is the minimum. If you remember how tennis scoring works, it will put you at a distinct advantage in getting past your mistake. So it does not matter at what point a player will begin winning or losing CONSECUTIVE points, the number of these points will remain the same as a minimum or a maximum. Blaine, feel free to delete any of these comments if they are too much. Once I got down to the brass tacks I was able to solve. Nice clue Blaine. Just got Blaine's clue, and it is pretty great, no bones about it. Not to toot my own horn, but I don't think this one was that hard. Toot away with a capital T, Professor. I think. I don't play tennis and will be sitting out this week. 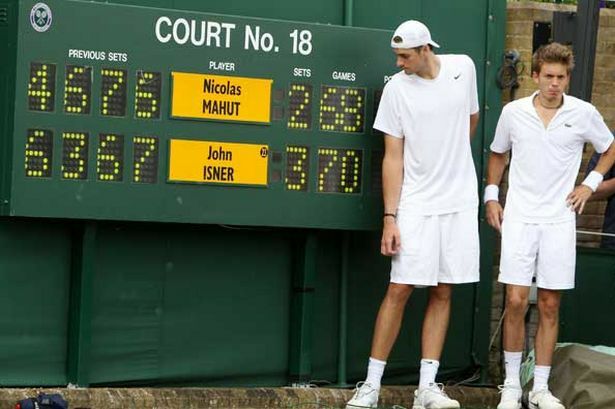 John Isner and Ivo Karlovic know the answer quite well. I like puzzles and have for over 60 years. It is only that fact that brings me here week after week to put up with the ineptitude of the man who calls himself "puzzlemaster." Since I know zip about tennis, I find myself in complete agreement with Tina Turner on this one. So should I be a little more loveless in my money transactions? I was expecting a puzzle theme related to the Memorial weekend if not the Indy 500. Instead, it's The French Open. I'm afraid it's been 30 or so laps and no crashes. So, it's almost as boring as the French Open! Where's the remote? To raise the interest on this score, I decided to concoct 2 offhand bonus puzzles. Sorry, but in the spirit of the weekly puzzle, they're sports and game related. Bonus puzzle 1 (baseball): It's the bottom of the 9th inning, and the batter hits a high pop-up. The outfielder moves to the spot, and at the last minute steps back, and lets the ball hit the ground. Taking it on the first bounce, the outfielder tosses it back to the infield. The outfielder is credited with winning the game after this odd move. Why? Bonus puzzle 2 (Jeopardy! ): Possibly more familiar to folks here: it's Double Jeopardy!, with one $2000 clue remaining (daily doubles already found) in a category you know nothing about - perhaps tennis rules. You purposely buzz in first, even though you don't know the answer. Why would you do this? I realized puzzle #2 doesn't work - unless I think of something else. Don't spend too much time on it. Let's say that, with seconds to play, I'm in the lead with $22,001, and my nearest competitor has $10,000. If I buzz in and lose $2000, I still have a lock on the game, going into Final Jeopardy. If I let my rival get the $2000 clue, he might win in Final. Yeah, eco, I agree that your puzzle #2 has a flaw that can't be overcome. . .
Jan figured my original solution, and Andy saw the flaw. Since I make flawed puzzles maybe I should be on NPR? But the baseball puzzle is still legit, I think. Puzzle 1 involves an outfielder, not an infielder? An infielder is possible, but an outfielder is much more likely in my scenario. The ball was hit to deep right field. It was also foul. If the outfielder caught it, the runner on third easily scores thus tying the game. The outfielder let's the ball drop,still only one out. The next pitch is a grounder to the short stop, who checks the runner and throws to first. The final batter strikes out. Loop has sussed out the scenario; my version had the game tied with the winning run on third base (greater drama), and of course the game would go to extra innings. I am reminded of a mathematical computation where you begin and end with the same number. Two nice puzzles in bad company. I am confident there are more music men here than tennis fans. I don't do logic puzzles, I'm not into tennis, and besides I'm still hung up on a few puzzles on Puzzleria! I'll have to pass this week. I think this puzzle would be more suitable for a different American holiday. 2200, that took forever, kinda. Blaine: "So basically you got to figure how many points you can get behind and still be able to catch up?" Lego: "Yeah, Blaine. And I've got a beef about the asterisk they placed after Roger Maris's record!" I DO know about tennis, since my ex was a teen-age tennis champion, and thus we watched a lot of the stuff early on....so I've sent in an answer, but of course, I could have somehow goofed. Cat gut is cat gut, andy. Agreed. But, catgut is not cat gut. I haven't played tennis in a VERY long time. But, this seems like pretty straight-forward math to me. No clues here. Although some have expressed disappointment (and worse) about this week’s puzzle, for those of us interested in and knowledgeable about the subject matter, it was really quite a nice puzzle; clearly stated, deep enough to be modestly challenging and satisfying to solve. Not all puzzles on NPR need to involve word play, and not all will be of interest or accessible to every listener. For some of us, this one was a welcome respite from anagrams, tedious lists of “famous” people and contemporary pop culture. Hear, hear, Lorenzo! I enjoyed this puzzle as well. For an amusing take on the game, check out the Flanders and Swann routine "Tried by the Centre Court." Well, this has been a slow Memorial Day. I decided to research this and try to figure this scoring system out. I think I have the right answer so we'll see, later. I think tennis is the hardest non-contact sport to master. The pros make it look easy. The scoring system is confusing and I think intimidates and discourages many beginners. "And that's all I'm going to say about that". The score was fourth less deuce less love. Now I'm really confused. I thought love is what makes a Subaru a Subaru. Never marry a tennis player. Love means nothing to them. What's all this I hear about "faithless love?" Love without faith is worse even that hate... Oh, wait, what's that, you said fourth less love?... Never mind. deferred to Lorenzo on the tennis puzzle, who then threw me a curve. struck out on the baseball puzzle. buzzed in too late on the Jeopardy puzzle. And now I find myself watching this video, wondering who that guy at the mike is and why he doesn't introduce himself. So clearly I'm no 'music man' either. By the way, does anybody understand how bowling is scored? I've been trying to figure it out for half a century (off and on). I was on a bowling team in Germany back in the 1960's, but haven't bowled since and no longer remember the scoring. You will probably need to ask a bowler, but I should warn you, they can hard to PIN down. And, as I recall, they tend to whisper. I'm not a bowler, sdb, but I am a kegler. That means I go to bowling alleys to drink beer. When I did bowl, I always had to bring my abacus and slide rule along with me to keep score. Paul knows darn well who that mike at the guy is... Kevin's uncle. Not a Music Man!? Paul makes Harold Hill look like Sigmund and Vlad! Do you really want to know how to score bowling, or was that an obscure clue? I'm embarrassed to admit I do know how to score bowling - though I'm more fedora. Taking it in high school gym had distinct advantages of being off campus, and not getting your chops busted for partaking in adult beverages and herbal products behind the building. Oh, geez, do I have to figure out this contextural meaning of 'fedora'? As they say in Germany when you leave one pin standing: "Nein." Do the Germans call the showy chunk of ice that sank the Titanic "a Homburg"? Okay, stretching here, if you don't like it tricorne. Or as my pop used to say, "Stetson". I have a very nice grey Stetson fedora that was made in the 1940's. I also have a Resistol black Homburg made in the 1950's that is 50% beaver. It goes well with my tux. And speaking of the Titanic. This past weekend I was at a wine tasting and, as usual, the wine term, TANNIN came up and caused me to devise this joke that was a big hit. What do tannin and the Titanic have in common? Answer: They both go down easy. Youse had me at jan. But I understood the piling on. 1 point for each pin knocked down (duh!). You get 2 balls per frame. If you get a strike (all pins down on the first ball) you get those 10 pins + the total pins from your next 2 balls. 3 strikes in a row thus totals 30 points on that frame, a strike + a strike plus (say) 7 pins = 27 pins. A strike + a spare = 20 points; A strike + 5 + 3 = 18 points. A spare (all pins down on the second ball) earns you 10 points + the pin count from your next roll. A spare + 7 pins = 17 points for that frame. A spare + a strike = 20 points. Part of the confusion is that if you are lucky enough to get a strike or a spare, you don't know your score for that frame until you've bowled the next frame (or two). If you're still sober and you get a strike or spare in the 10th frame, you get one extra roll (spare) or 2 extra rolls (strike). Did that end 50 years of confusion or did I miss your well concealed hint? Unless I'm mistaken, I think seeing that new movie "Money Monster" might help some of you. Although I have solved this puzzle and will, if selected, wear my pin with pride, I don't consider this a puzzle. It was more a test of one's knowledge of game trivia. I prefer puzzles that take me out of the box. Well-stated, SuperZee. Will has had a mess o' quite entertaining and clever puzzles thus far in 2016, but this one seems to be a mere exercise in computation. (I still harbor a slight hope that, even though the puzzle text explicitly states the puzzle is "straightforward" and that there is "no trick" involved, that somehow that disclaimer is a smoke screen, and that a colossal trick will turn out to be involved. There is no joy in counting beans. I did manage to scare up one "Riff/Rip-Off Shortz" puzzle for this Friday's Puzzleria!, but only one... so far. At least this week's puzzle was not one of those geometric shape ones, where you have to count all the triangles inside of it. I always hate those types! I noted all the "76 trombones" hints, but I can't figure more than 72 points, after being up 40-love. That's what I had! 25+24+23, but then I forgot how it was I got that 25. Lorenzo posted a comment indicating he had a different answer than the one being hinted at in the musical clues. I had to reread to figure out what musical clues he was talking about. I decided to actually try to figure it out, and, sure enough, came up with a slightly smaller number, but by that time, Lorenzo had deleted his comment, so, I don't know, is the answer really 76?? Meanwhile, I think I may be beginning to figure out this bowling thing. I can roll 19 straight gutter balls and still win (if my opponent is really lousy), or I can roll 11 straight strikes and still lose (if my opponent is really good, or lucky, or, probably, both). Right? Just because I'm a glutton for punishment, I made another attempt to figure out backgammon this morning. I found a tutorial series on YouTube that was actually pretty helpful. It looks like the wind has abated a bit, so now I can get back to my true calling. I'm told true torture is figuring out the rules for cricket. Sometimes I hear the scores on BBC and I have no idea what any of that means. I thought so, too, at first. Then I thought, what if you start out ahead 40-zip; your opponent needs one more point to win the first game. But, if you start out winning the first 5 games, and win the first 3 points in the 6th game, your opponent needs to win 5 points to win the game and (6 * 4) = 24 more points (29 total) to win the set. So, yes it's 29 + 24 + 20 + 3 = 76, I believe. I'm afraid I've learned more about tennis than I ever thought I would. I didn't even consider that extra five points in the first game! If you are ahead 5 - 0, 40 - 0 , you need to lose 5 points to lose that game, then lose 6 more games, 24 points, to lose that set, that is 29 points. Then 24 and 23, for a total of 76. I still don't get Blaine's clue. I started with 71 Sunday morning but upped it to 76 by Tuesday. I don't yet get Blaine's clue either. I thought that it takes 3 sets to win, 24 points per set for a total of 72. So you could be down 2 sets (48 pts), 5 games(20pts) and 3 pts for a total of 71?? I came up with 76, as David and runon explain. My bonus puzzle had hints alluding to this puzzle, "raise the interest on this score" from the 3rd verse of 76 Trombones "a full octave higher than the score", concoct and offhand as synonyms for "Clarinets of eve'ry size and trumpeters who'd improvise", and the "spirit" (of '76?) of the weekly puzzle. Two keys to get 76: 1. The match loser begins from behind, not even. Down 5 games + 3 points. 2. No "modern" tiebreaker, so games and sets have to be won by two points or two games. My mathematical computation when you start and end with the same number is "Minus 0", which anagrams to "Osmium" (if you change the "0" to "O"), which is the element with atomic number 76. It looks like I whiffed on the puzzle (I sent in "71") But I think I understand Blaine's clue... if, that is, he too whiffed and thought the answer was 71. Here is the site that made me think Blaine and I might be on the same # 71 track, and that prompted my "beef" about Roger Maris's home run record (61 in '61) having an asterisk after it. "So basically you have got to figure how many points you can get behind and still be able to catch up?" Like Lorenzo, I thought "catch up" was a "ketchup" pun. But I knew the answer could not be 57 (as in Heinz). I suspected the answer was 71 (I'm not even sure why, at the moment), so went out and found a website (see my comment above) confirming that 71 was correct, and that Blaine was hinting the same! As for the consensus correct answer given here today, I get the 29 [5 + 5(4)]. I get the 24 [5(4)]. But how do we get 23 instead of 24 for the clinching set? Game set and match if you lose the 24th point in the clinching set. Stop at 23, down 0-5 and 0-40. You can rally and still win the match. I also came up with 76. Although a match nominally consists of five sets of six, four point games, the rules require you to win a game by at least two points and a set by at least two games... With these caveats, the numbers work as David and Runon explained. As to Blaine's clue, he did show sets with seven games...not six.. Initially I had 71, but deleted my post after getting 76. I assume Blaine's clue referred to 76 trombones leading and cornets right behind, presumably trying to catch up. At first I thought Blaine could be referring to Heinz 57 varieties ketchup! I had 76. This the reference to brass tacks (for trombones). And my reference to another holiday being 4th of July for celebrating the spirit of 76. I believe Blaine's clue was that in his rehash of the puzzle he uses 76 characters. If you start up 40-love, you need to lose 5 consecutive points to lose this game; now if you lose EVERY consecutive point up to match point, you will lose 20 more points in the 1st set, 24 points in the 2nd set and 23 points in the 3rd set to arrive at match point where you must win the next point to not be defeated and still win the match. This means you can lose a maximum of 5 + 20 + 24 + 23 = 72 total consecutive points. Except that since the modern tiebreak rules do not apply, you have to win 6 more games to win that first set 7-5. Four additional points. I am glad I did not work on this. Does that mean the come back kid needs 77? That would be a sillier game than this one. No. Once the ultimate match winner stops the consecutive string at 76, the remaining points and games can take all sorts of twists, turns, ties, ads, deuces, and who knows what all. In how many other games can you be down 76 points and still win? Are there any instances of this actually happening in pro or college tennis? Some games of darts, perhaps? I hear cricket scores of 275 for 3, and while I have no idea what that means, I think you can score several hundred runs in an inning. My Indian friends tell me matches can go for a very long time. I seriously doubt anyone has scored 76 straight points in tennis. It wouldn't surprise me if the Globetrotters spotted the Generals 76 points a time or two. But it wouldn't surprise me if they never did. You're just a difficult man to surprise, aren't you, Paul? I try to maintain an awareness of my surroundings. It is good to be well rounded. Of course George Custer was well aware of his surroundings, but it didn't help him much in the end. I suspect he would have said the point was well taken. See, I always know what to say! Thank you for that. I am embarrassed at not having this recording in my collection. It is wonderful. I am taking a break from watching Spotlight, the movie, which I just obtained from the library this afternoon. I am thoroughly enjoying both. Gee, gents, I feel so uncouth as I was listening to this, which at least is relevant for this week. And wakes me up. That was fun, eco, knee-licking and all! Knee-licking would be a great state sport, I'm calling my legislator. Too bad Colorado already has pack burro racing as its state sport. I like the rule that humans may not ride the burro, but they are allowed to carry the burro. This week’s Puzzleria! is now Uploaded. The puzzles are fresh, piping hot out of the oven! We also offer you a Ripping-Off-Shortz tennis puzzle that actually involves Will Shortz in its set-up! And, there are seven other puzzles, one of which involves geometry. But, best of all (and I know many Blainesvillians will be ecstatic about this news), all nine P! puzzles this week are 100% ANAGRAM-FREE!. WW- last night the Mariners rallied from a 10 run deficit to beat the Padres 16-13.
andy, 10 run deficit is certainly admirable. . .but it's no 76, eh? Keeping spirits going for 76 points seems nigh unto impossible, especially with the change in service every game. . . When I was in high school, I was lucky enough to see a popular California horse named Silky Sullivan run a couple of times at Santa Anita. He and his usual jockey, Bill Shoemaker, would routinely lie back about 40 lengths on the backstretch, presumably an insurmaoutable distance, and then go on to win. As exciting a thing as I, and everyone else, ever saw. I'd rather curse the sport of boxing that may have caused his affliction. Though that's debated. Of course without boxing Ali wouldn't have risen to the heights he did. He was certainly greater than his world. Next week's challenge: Name a famous actor — seven-letter first name, four-letter last name. Take four consecutive letters from the first name and three consecutive letters from the last name. These seven letters, in order from left to right, will name something that's often packed nowadays when taking a trip. What is it? Most easily solved by working backwards from the packed item. Jan, did this puzzle seem pretty easy to you? Unlike the tennis question, the answer to this one will be difficult to avoid! Somehow, I don't think Milphot Boid is the right actor, even though forgetting your photo ID can make it hard to get on an airplane. Not having your ID is one of the problems that can't be solved by waving your AMEX card. There are multitudinous comments; I didn't read them all. I apologize if the following has already been addressed. The answer, I believe, is 78. If the streak begins during a tiebreak, seven points are required to win - thus possible to be scored consecutively to begin a scoring run of 78 in a row.